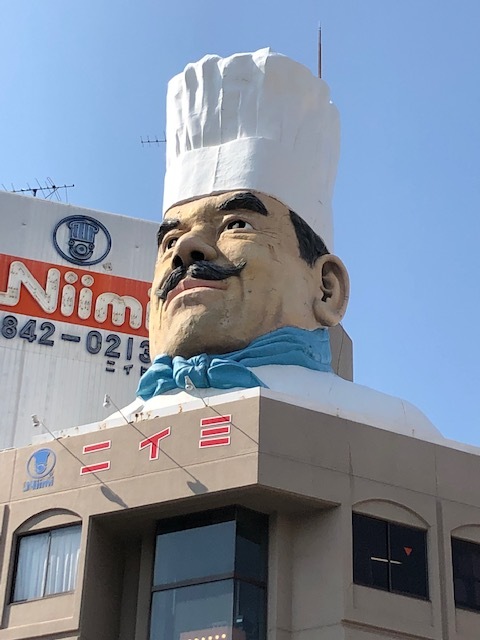 A giant chef statue marks the entrance to Kappabashi. One of the most interesting and fun places we visited back when we were stationed in Japan was Kappabashi, or Tokyo’s “kitchen district.” The district is actually a long street lined on either side with stores that provide supplies to restaurants, bakeries, tea and coffee shops, noodle stands and home kitchens – anywhere food is prepared and served in Japan. You can find everything kitchen-related here: dishes, pots, pans of all shapes and size, baking pans and supplies, utensils, knives, glassware, uniforms, cookie cutters, every kitchen gadget imaginable and anything else a cook might want or desire. There are also stores that sell lanterns for the front of restaurants, signs for restaurants, uniforms, and realistic plastic food samples used for restaurant display windows. Brett and I told ourselves when we went last Tuesday that we were only going to go and look, but I tucked some extra yen into my purse in case we saw something we had to have. 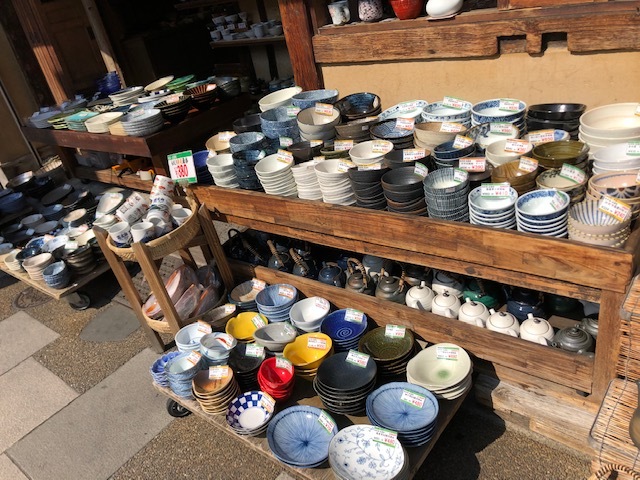 We have been planning to buy some plates and soup bowls while we’re here in Japan, and I knew there was a chance we might find something we liked in Kappabashi. We had an easy train ride to the area, about 35 minutes from our station, a big change from when we lived here before and our train trip was nearly 1 1/2 hours each way. Two Japanese men stepped up at our station to help us buy our tickets when we couldn’t find the stop on the station map (if you look confused in Japan, someone will always step forward to help you). I remarked to one of them that he sounded like a native English speaker, and it turned out he had been born and grew up in the Los Angeles area, in the next town over from my hometown! This dish store had beautiful and affordable items. Japanese dish stores are dangerous places for me because I’m the proverbial kid in the candy store and want almost everything. Coming out of the station, we turned to the right around the corner and headed down the street until we saw the giant chef statue, the sign that we had reached Kappabashi. Of course, the first shop we came to when we arrived had to be a large dish store where I could have happily spent all our money before looking at another thing because they had good prices and a big selection of beautiful dishes. However, I was able to restrain myself and only looked, and then Brett and I headed across the street to look at the rest of the shops. We did well fin keeping our money even though we saw many tempting items, but finally met our match at a large all-purpose kitchen store that catered not to restaurants but to home cooks. This place had everything for the kitchen it seemed but the kitchen sink, and in every size, color, shape or design imaginable. Brett and I strolled around and ended up with a small stainless steel mesh basket (for washing rice), a six-pack of microfiber cloths, and a pack of bamboo chopsticks (with a twist at the top, my favorite design), all things we need to replace and could easily fit into our suitcases. After walking for a while we turned down a side street when we spotted a huge temple sitting just a block off of Kappabashi Street. We had seen on an area map that lots of temples and shrines were in the area, but were surprised to see one this close. 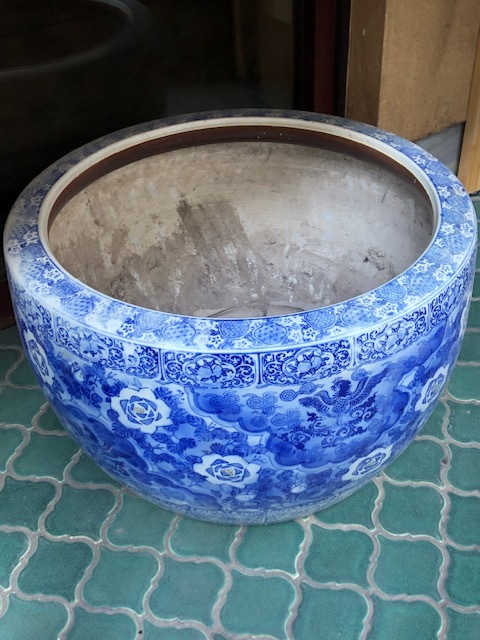 The little street also was home to a small antique store with a beautiful blue Imari hibachi sitting out front. Back in the day I would have probably picked up one or two things from there as well, but I restrained myself this time. Higashi-Honganji Temple is one of the oldest temples in Tokyo, established in 1651. I could have happily taken this beautiful hibachi home with me but didn’t think it was fair to ask Brett to carry it. We crossed over to the opposite side of the street after a while as we could see several dish stores (the side we started on had more pots, pans and other cooking implements). Dish stores are always fun for me to go into because I absolutely love Japanese dishes! We eventually found some reasonably priced pottery salad plates in one store that called our names ($8.60/plate) and bought five, and then found even more reasonably priced pottery soup bowls ($2.88/bowl) in another store and bought five of those. Both were carefully wrapped up and will be carried onto the plane with us when we fly home. We also found and bought two packages of our favorite toothpicks – we’ll never need to buy them again in our lifetimes. One of the most interesting things to check out on Kappabashi are the stores selling plastic food samples. We wandered through a couple of them with large selections of plastic food and were amazed by the skill and artistry of the work. I’ve added a video below of how plastic food is made – it’s quite amazing. Plastic food is not cheap either – pieces of sushi start at $5 and go up from there, and an item like a fancy ice cream sundae or bowl of ramen can cost over $100. The video below shows how a couple of different items are made (it’s in Japanese, but you don’t need the sound to understand what’s going on). We had a great time visiting Kappabashi and we’d like to go back once more if we can – we think we’d like to get two dinner-size plates, and some dessert plates if we can find some we like. 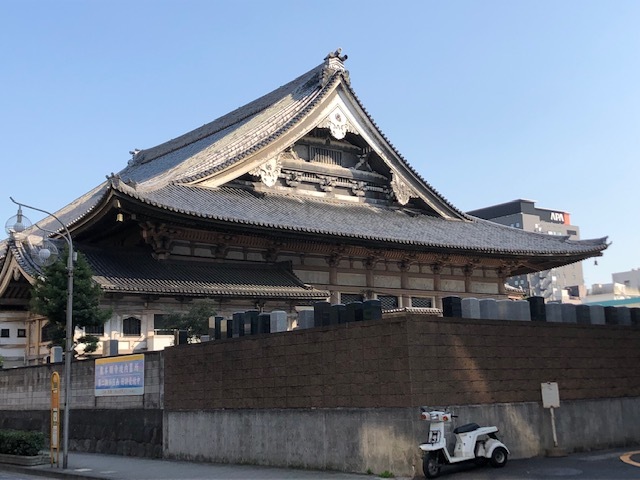 The train station for Kappabashi (Tawaramachi) is also just one stop away from Asakusa, where Sensoji-Temple is located, and we could make a day of it. But for now we’re happy and satisfied with our purchases and the items we bought, and glad we made the effort to go again to Kappabashi. 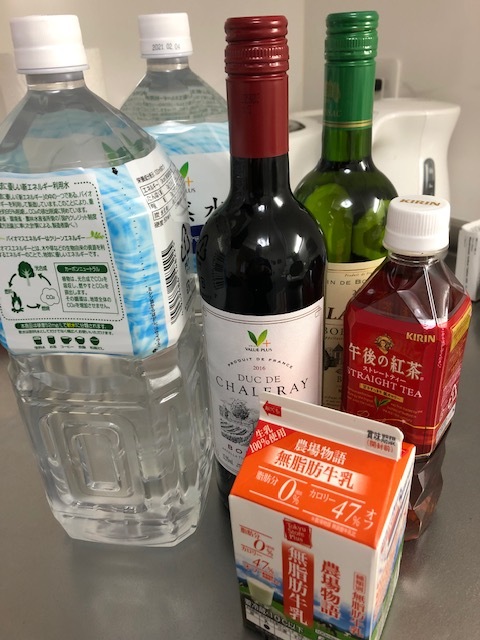 Although we have access to the commissaries and American-style supermarkets and products on several bases in the Tokyo area, Brett and I decided we wanted to do as much as possible of our food shopping “out on the economy” (the military expression for anything off base). Not only would it be more convenient, but we wanted to see what it would cost to feed ourselves if we lived here, and what and how we eat might change. Japanese shoppers typically only buy enough food for a couple of days at a time so that they are getting the freshest food possible. And, because Japanese meals usually consist of small servings of several different items, and kitchen storage space is minimal compared to the U.S., product sizes are much, much smaller than what Americans are used to. There are no big family packs of anything, no big cuts of meat, or five-pound bags of fruit. Loaves of bread have maybe six slices at most. We did our weekly food shop at the Tokyu supermarket this past Saturday. We feel very lucky to have such a big supermarket nearby as they offer store brands and regularly have sales going on. Shopping carts, as I’ve mentioned, are just a standard plastic shopping basket on a trolley, but because the sizes of everything are so small we can really pack a lot into one of those baskets. We spent a little more than we usually do last weekend, but that was due to the addition of a few items we don’t regularly buy, like two bottles of wine and a bag of flour. 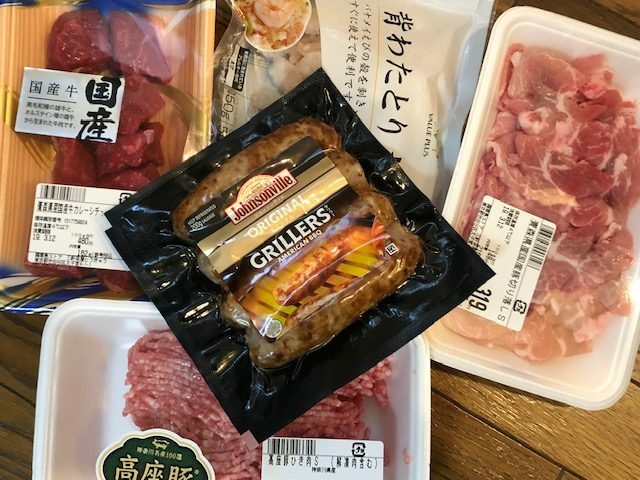 We also purchased a couple of splurge items, and spent more on one item because we decided to buy the more expensive “American” name brand (Johnsonville sausages) when we couldn’t figure out any of the similar Japanese products. Our haul from the bakery – all of this deliciousness cost around $8. 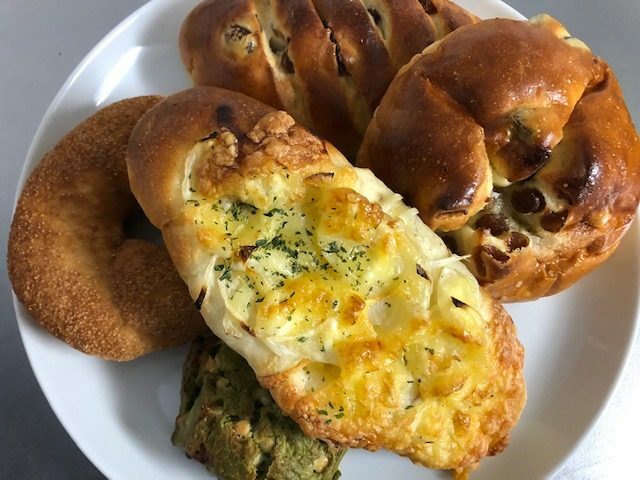 We began our shopping trip with a visit to the bakery just down the street, where we bought two raisin rolls, an onion and cheese roll (for me), a cinnamon doughnut (for Brett) and a matcha cookie (for me). The raisin rolls were deliciously yeasty and light and we ate them for breakfast on Sunday morning along with some fruit. The onion and cheese roll was my breakfast this morning. 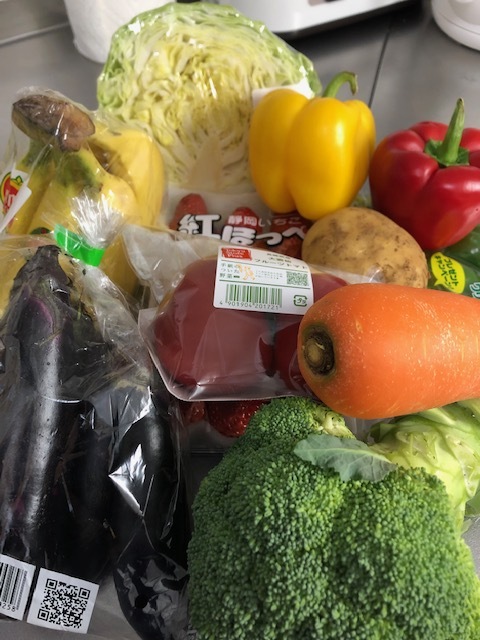 Below are pictures of what we bought this week at the supermarket, a fairly typical weekly shop for us. It was an all-food shop as well – we didn’t buy any toiletries or other non-food items. To give an idea of how small the below items are, everything fit into one standard size plastic shopping basket. Our produce purchases included a small head of broccoli; a bag of small eggplants (for mabo nasu); a carrot and a potato for curry; red, yellow and a bag of small green peppers for a pork & pepper stir fry; two tomatoes for BLTs (we have some bacon in the freezer, and lettuce in the fridge that needs to get finished); half of a cabbage for another stir fry and some cole slaw; and bananas and strawberries. Our meat purchases were beef stew meat for the curry; ground pork for the mabo nasu; thinly sliced pork for a stir fry; a bag of frozen shrimp for chili shrimp; and Johnsonville sausages. We’re not exactly sure what type of sausages they are but we’re going to have them for breakfast. None of the meat packages weighs more than a quarter pound. The beef was the most expensive at $7 for that tiny package while the pork for stir fry was around $2.89. 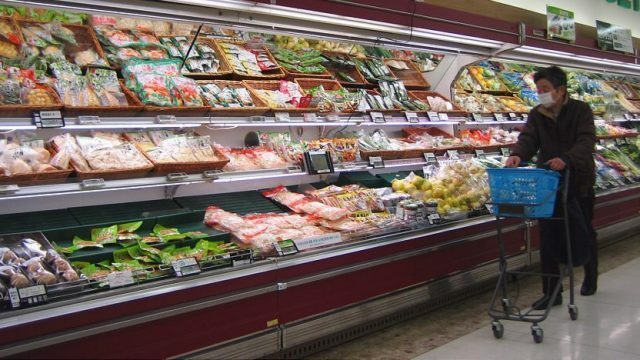 The seafood selection at the store is immense, but there are many things we don’t recognize. There are also several cuts of meat we don’t recognize either. 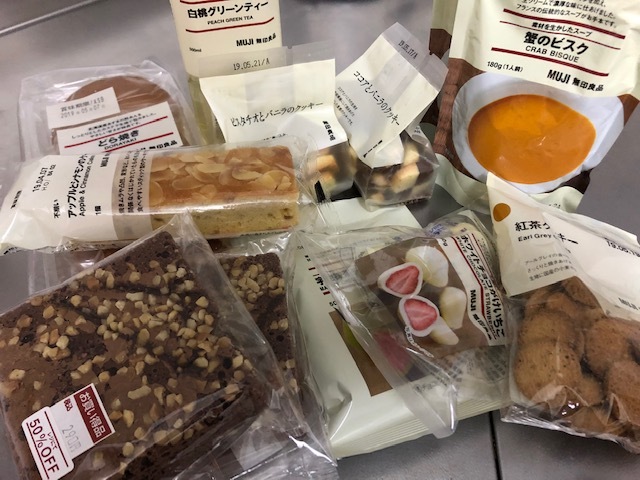 We bought two bags of raisin cookies (there are only five packages in each bag and the cookies are tiny); a package of sesame biscuits; two bags of soy peanut crackers, our favorite snack; two matcha cream cookies that we want to try (they were very good! 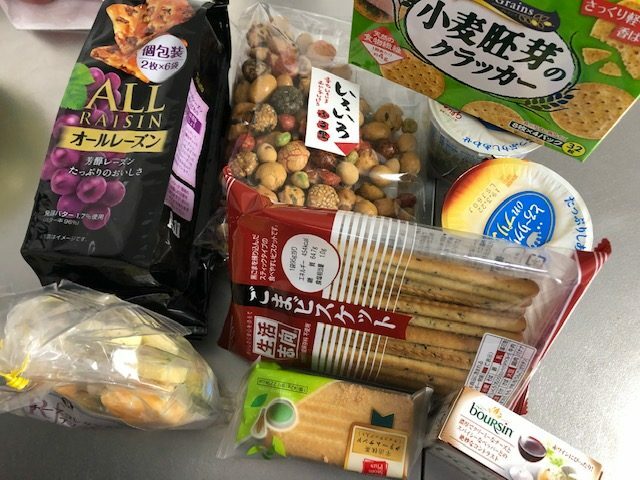 ); a bag of cheese snacks for the grands; two individual containers of purin (a flan-style custard) for dessert one evening; a package of Boursin pepper cheese, a surprise find as well as a total splurge for us; and wheat crackers to have with the cheese. Beverage purchases included a small container of fat-free milk to use for pancakes and cereal; a bottle of unsweetened iced tea for Brett; two bottles of French wine, one red and one white (both are from Bordeaux, are delicious, and were surprisingly affordable); and two bottles of water. The bottled water is for drinking – there are still lingering concerns because of the Fukushima accident. All plastic bottles in Japan are recycled – we have a separate container for them in the apartment. 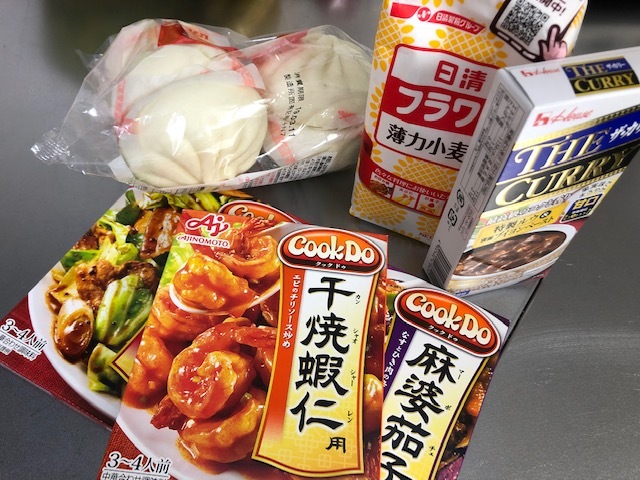 Miscellaneous items include three Cook Do sauces (chili shrimp, mabo nasu, and pork and cabbage stir fry); a box of curry sauce cubes; a small bag of flour for pancakes; and a bag of Chinese steamed pork buns (nikuman). Tokyu supermarket, like almost all markets in Japan, has a wide selection of high-quality, affordable prepared foods for sale. 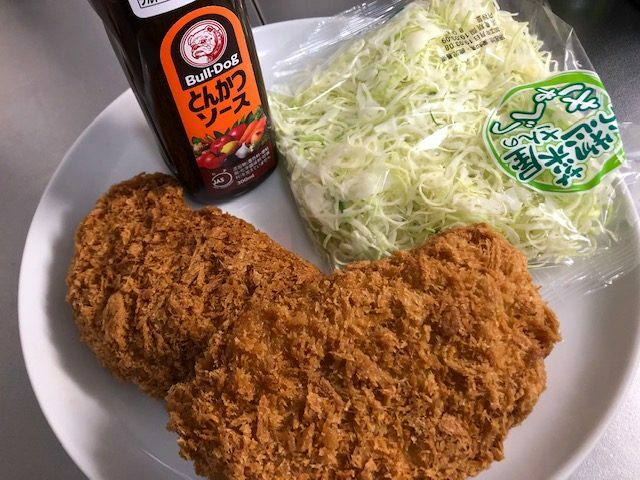 We bought two katsu (panko-breaded fried pork cutlets), finely-shredded cabbage, and tonkatsu sauce for our Saturday night dinner – all I had to do was make rice and we had a delicious restaurant-style meal for around $8! Everything we bought is recognizable to us, and we know what it tastes like and what to do with it, but about 75% of what’s available in the market are things we have no idea about how to cook or what they are (even if I can read the label). So, we are fairly constrained in what we buy compared to what’s available although we try to push our boundaries from time to time. Food is expensive in Japan – there’s no getting around that – and we’re fortunate to not have to feed a family over here, at least not cooking the way we do now. For just Brett and I though the expense hasn’t been bad. The total amount spent this past weekend was $123.76, more than usual but still within our food budget of $500/month. Brett would like us to segue into more frequent shopping trips so that we don’t have to carry several heavy bags of food back to the apartment, but I worry that doing so might mean we spend more. Maybe shopping twice a week might be the answer though. Some of what we bought will segue into next week’s meals as we’ll probably have dinner a couple of times with our son and family. Still, we’ve got everything we need for some tasty meals this week! The calm before the light changes at the famous Shibuya Crossing. Cold rain was falling once again when we got up on Monday morning, and at first we thought we just stay in for the day. We did a couple of loads of laundry, but by early afternoon we were starting to go stir crazy so we grabbed our coats, gloves, umbrellas and our trusty canvas shopping bag and went to visit Shibuya, two stops away on our subway line, and one of Tokyo’s busiest major transit, shopping, and nightlife areas. 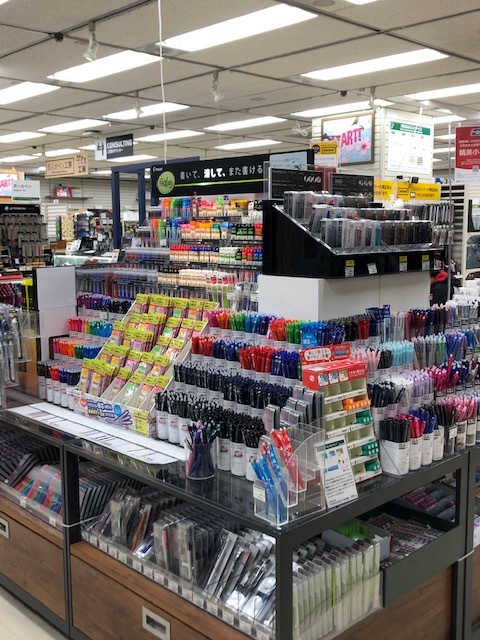 Our plan was to spend some time checking out the Tokyu Hands flagship store, and then head back to Shibuya station to ride one stop to Ebisu Station so we could visit the Muji store, which had been recently expanded. The crowd begins to head out into the crosswalks the second the light changes. Even on a rainy there were a LOT of people in Shibuya. These BIG crosswalks go in three directions. 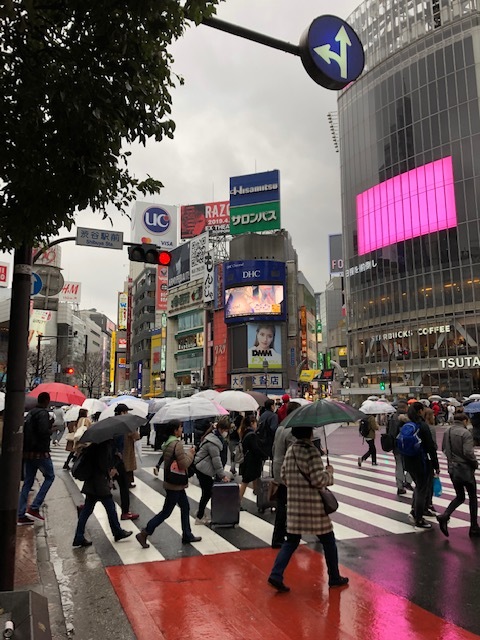 Shibuya is always busy and full of people, and the fact that it was raining didn’t change that other than everyone was carrying an umbrella, so walking around was a bit of a challenge. The Japanese seemed to do it effortlessly while Brett and I struggled to not bump into others with our umbrellas. Thankfully the walk from our subway exit to Tokyu Hands was easy, and only took a few minutes. Does anyone need a pen? This floor was dedicated to writing instruments and notebooks. My favorite floor is always 4C, kitchenware. I could happily wander around here for ages, checking out all the gadgets and dishes. 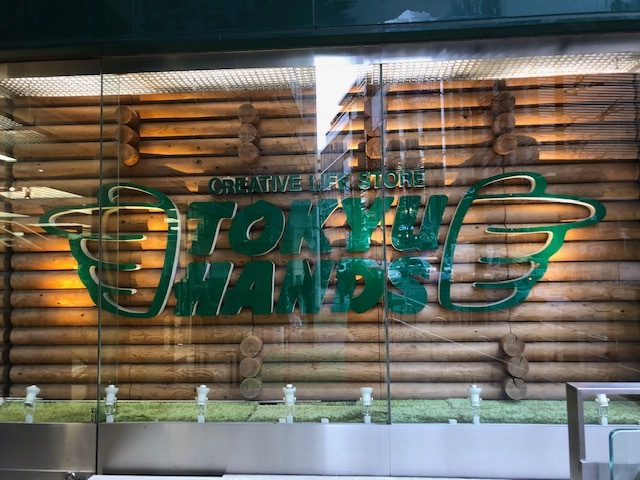 Tokyu Hands has been called the ultimate DIY store, but it also showcases plenty of Japanese design and innovation. The flagship store has seven floors, plus two basement levels. Each of the floors (other than the basement) is divided into three levels – A,B & C – so combined with the two basement levels there are 23 floors, each dedicated to a different theme, from tools to interiors to kitchen to bathroom to paper to crafts to stationery and so forth. It can take a while to go through each floor, but it’s still a lot of fun and a good way to spend a couple of hours. We found a few things we had been looking for, like 3M Command hooks for the kitchen, an over-the-door hook for the bathroom (there are no hooks in this apartment), a notebook for Brett, and a new rice paddle for the rice cooker (the one in the house had melted and didn’t work very well). I also restrained myself in the kitchen section and only bought two small Japanese dishes (that I can use in multiple ways). 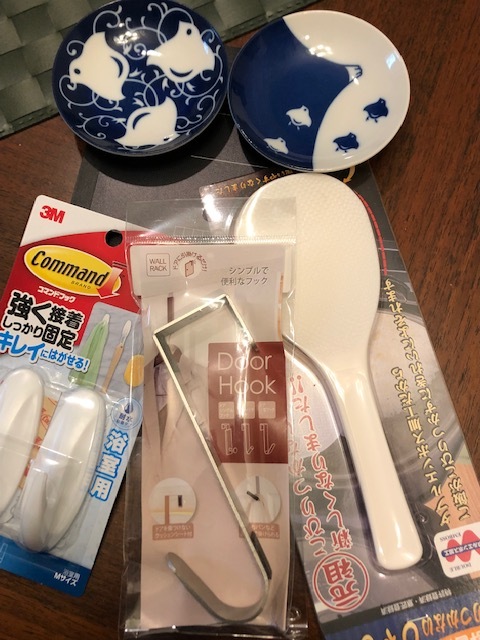 Our swag from Tokyu Hands – we were happy to finally find 3M Command hooks there. The little bird design on the dishes, chidori (plovers), is one of my favorite Japanese motifs as is Mt. Fuji. At the top of the store is a small snack bar where we took a short coffee break. 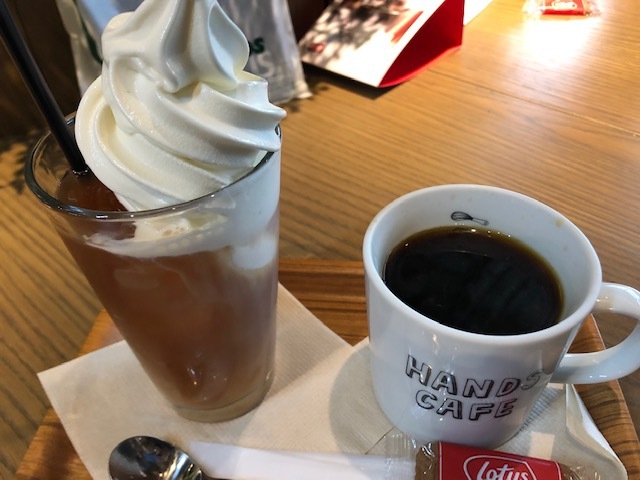 Well, Brett had coffee but I decided to try a “tea float” – iced Earl Grey tea with a large swirl of soft ice cream. It was amazingly delicious and refreshing, and I will definitely be going back some day for another! Brett said his coffee was just OK, but my Earl Grey tea float was out of this world! 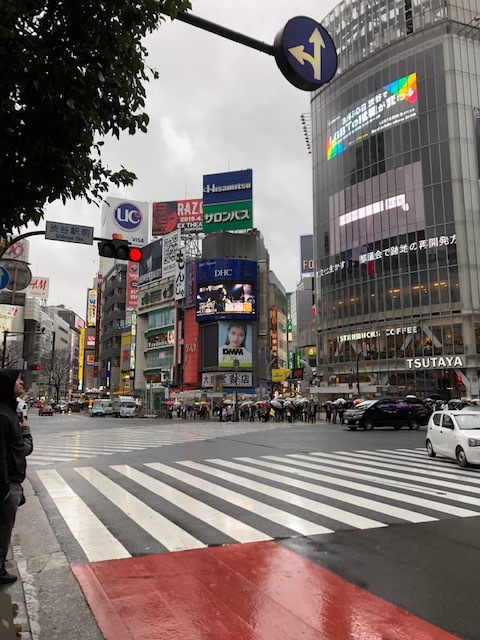 Leaving Tokyu Hands, we walked back to Shibuya station by a different route in order for Brett to experience the famous Shibuya crossing in front of the main station. After making it across we stopped in front of the station to check out the Hachiko memorial statue, hero of one of the most beloved stories in Japan. Hachiko (an Akita) used to walk to Shibuya station every day to meet his owner, a doctor, when he came home from work. Sadly, the doctor died one day while at work, but Hachiko continued to come to the station every single afternoon for 10 years to wait for the doctor. 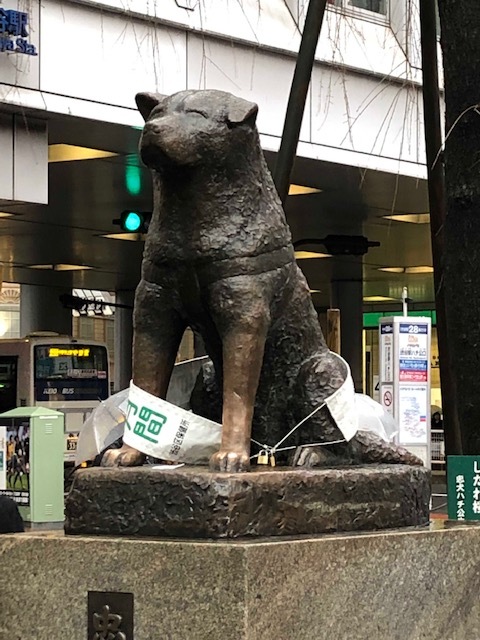 Hachiko is still honored and remembered for his perseverance, loyalty and fidelity, and the statue is a must-see for anyone visiting Shibuya. It’s a well-known place to meet someone, and these days there is usually a long line of people waiting to get their picture taken with the statue (even in the rain). Japanese train stations are usually not merely places to get on and off, or change trains – in urban areas they are typically surrounded by large shopping districts, especially in the busier parts of the Tokyo area, like Shinjuku or Yokohama. Many larger stations have one or two levels underneath like giant shopping malls as well as stores above and around the station. Ebisu is surrounded by a huge shopping venue called Atré, consisting of eight floors with all kinds of stores, including food shops and restaurants. There is a huge escalator in front of the station that takes shoppers up to the fourth floor, where the entrance to Muji is located as well as several different food-related shops. Our purchase from Kyo Hyahashiya is ready to face the rain! Matcha roll cake is a very special treat for me, and no one does it better than Kyo Hyahashiya in my opinion. Our first stop in Atré was Kyo Hyahashiya, a Japanese confectionary, for one of their scrumptious matcha (powdered green tea) roll cakes, a splurge as they are not cheap. Their cakes and sweets are made in the Kyoto style and most feature matcha in some form. 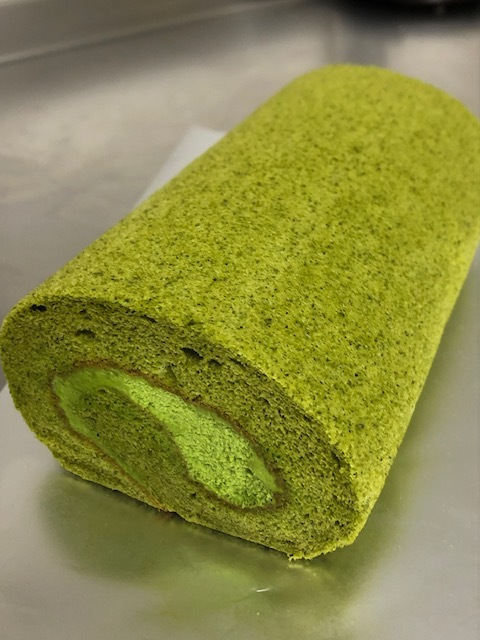 The roll cake is made from an incredibly light matcha sponge and filled with a rich matcha cream and a touch of red sweet bean paste – it’s my favorite Japanese cake. 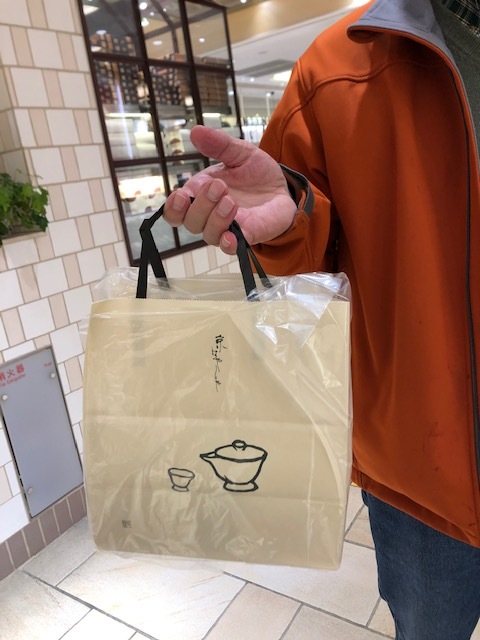 Besides receiving lots of bows from the staff following our purchase, our clerk also wrapped our bag in a plastic cover because it was raining – Japanese service at its best! 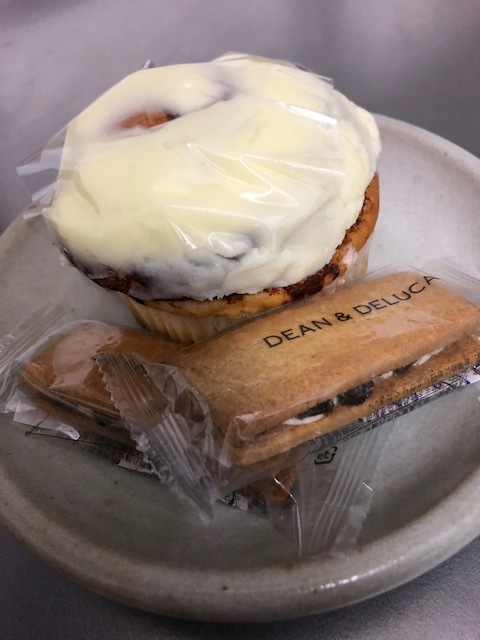 Our BIG D&D cinnamon rolls were an affordable, delicious and special breakfast. The raisin-creme cookies were very good too. Brett had spotted some large cinnamon rolls in the window at the nearby Dean & Deluca store along the way, so we went back there and bought a couple of those for today’s breakfast (they were surprisingly affordable), and at the cash register we found my favorite Japanese cookies, raisin-creme sandwich, so we bought a couple of those as well. Raisin-creme sandwiches were a very popular cookie back in the early 1990s, during our second tour, but not so much these days so I am always happy when I can find them. The Muji aesthetic is one of simple, affordable function. 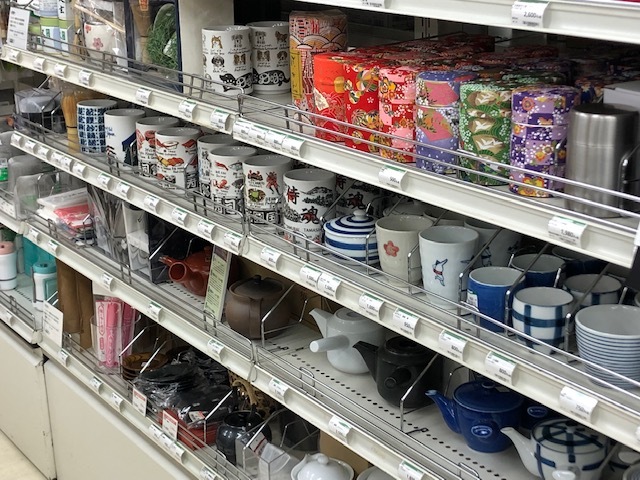 The Muji food and kitchenware section – I had to restrain myself. Our final stop for the day was the Muji store, which used to be located on one floor at the top of Atré but is now a full two stories in a newly built annex. 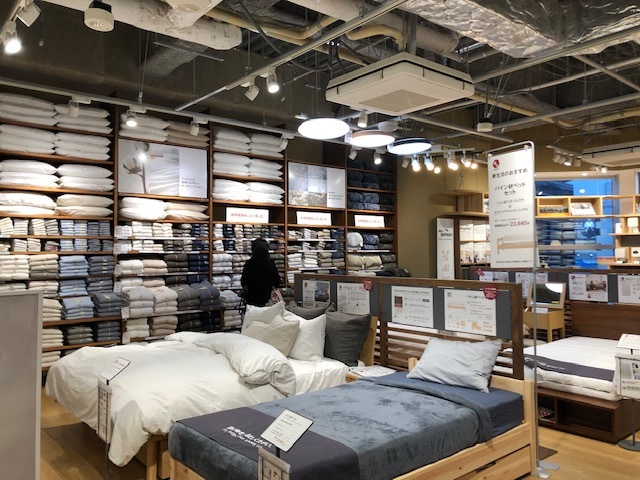 Muji is something like a Japanese IKEA, but besides simple, stylish and affordable housewares they also carry simple, and stylish clothing and books, and have a nice food section as well. 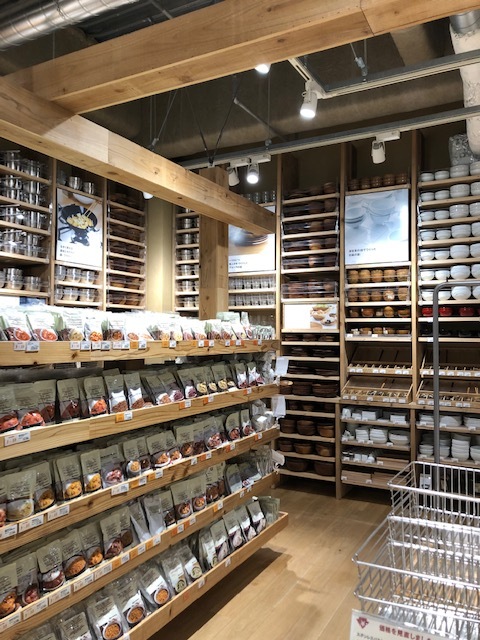 I could happily live with just about everything in Muji, but Brett and I restrained ourselves and only bought a few items from the food section. Our Muji purchases were inexpensive treats to go with our afternoon coffee as well as two packages of crab bisque, and bottle of delicious peach green tea. Then it was back to Shibuya where we caught a very crowded, packed express subway back to Sangenjaya station for our short walk back to the apartment. In spite of the rain and the crowds we had an absolutely wonderful day, found things we needed, and didn’t spend much! Two trips to the commissary and one to the Navy Exchange in the past two weeks exploded our daily spending average for February. The commissary on the Yokosuka base was huge, with many affordable temptations but we stuck to necessary items only (I consider Diet Coke necessary). February was not a good month, budget-wise. We always knew that our stay Japan would be expensive and push the boundaries of our budget. Following two weeks in Sydney and New Zealand, we arrived in Japan slightly over budget. Our first two weeks here ratcheted our daily and monthly spending up even more. With a few no-spend days so far this week we have managed to get our daily average back down to a more acceptable level, but we’re ending the month with a daily spending average of $56.93 ($194.04 for the month). Ouch. 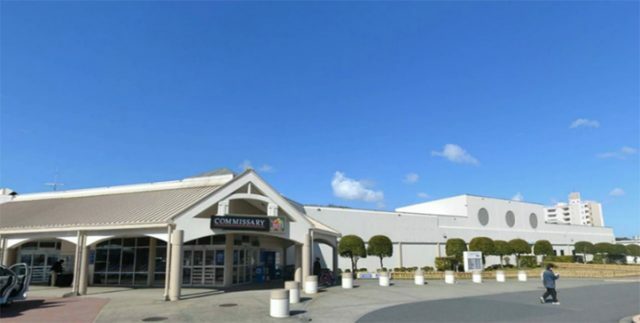 The biggest reason for our higher average in Japan were trips to the commissary and exchange at NAF Atsugi and another trip this week to the commissary at the Yokosuka naval base. Although prices were low we bought a lot of stuff to settle in and replenish supplies, as well as things we needed in the apartment, like food storage containers, extra toilet paper, and laundry supplies. The upside is that we are starting March with a comfortable amount of yen in our wallets, and we are well-stocked with essentials and pantry basics. We will need to buy produce, meat and other smaller items (i.e. butter, yogurt) from the Japanese supermarket in the next few days but otherwise spending should be at a minimum. February – not our finest month when it comes to staying on track with the budget. I tell myself that it could have been worse, and that we’ll hopefully see a better monthly average at the end of March. Tile murals of old Lisbon surround the outside of the Sant’Anna showroom. Brett and I both still feel quite miserable (although better than yesterday), but today was gorgeous – warm and sunny – so we decided to go out for a short while and visit the showroom of Fábrica Sant’Anna, located a short distance away from our apartment. Fábrica Sant’Anna is Lisbon’s oldest azulejos (tile) maker, in business since 1741. 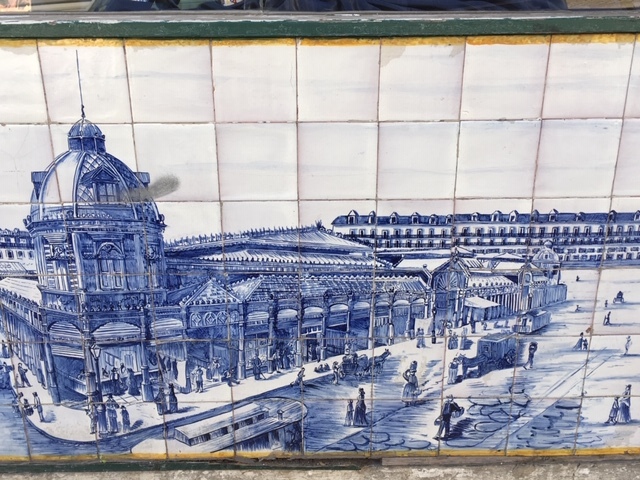 Portugal is known for its decorative tiles, which can be seen everywhere and can cover entire buildings (serving as sort of temperature control) or be used to create historic or cultural murals, tile panels or other decorations. 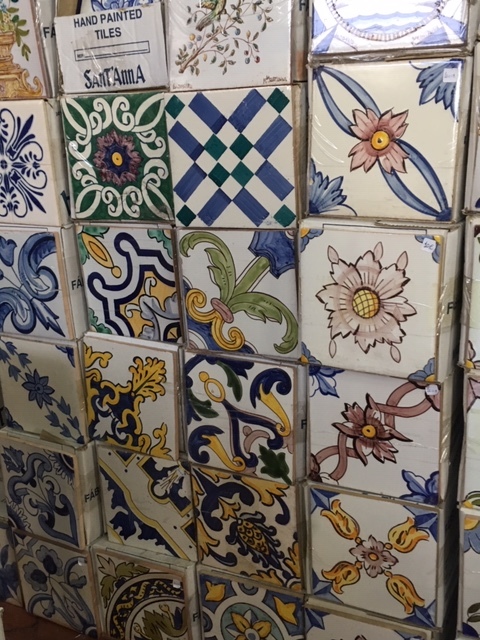 Although we had hoped to visit the national tile museum, the Sant’Anna showroom was an easy outing for us and a delightful way to check out traditional Portuguese tiles and ceramics. Just a few of the many hand-painted tile designs produced by Sant’Anna. 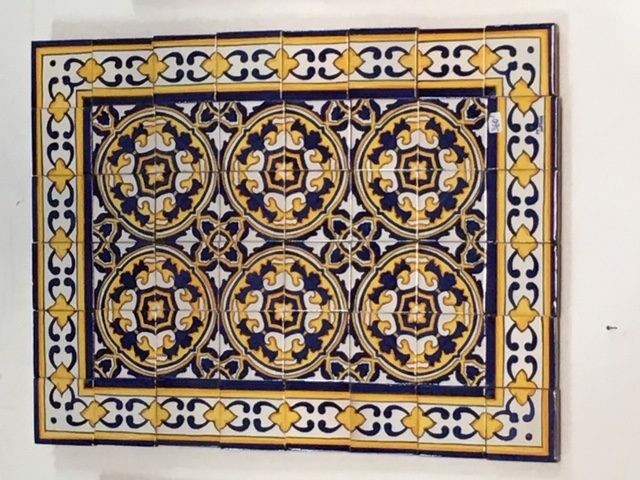 This lovely blue and yellow tile panel could be installed either inside or outside for decoration. Fabrica Sant’Anna is the last of its kind in Lisbon, a store where every piece of ceramic is made and painted by hand – many of the tile products seen around town in souvenir and other shops are actually machine-made these days. Prices at Sant’Anna are not low, but they are lower than many other tile shops in Lisbon. 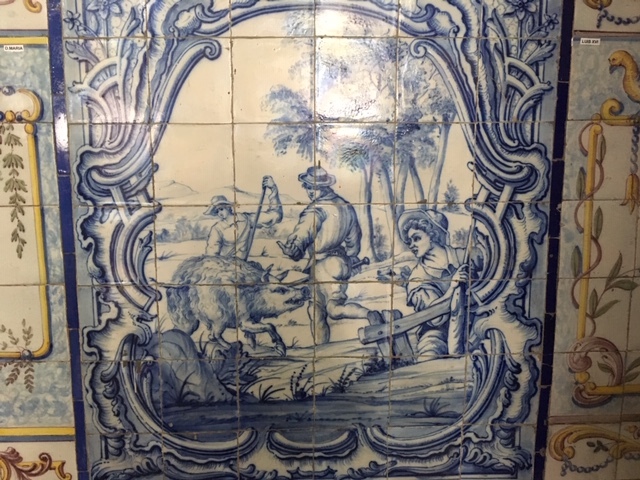 The Sant’Anna ceramic factory is in Belem, west of Lisbon, and tours are available by appointment. 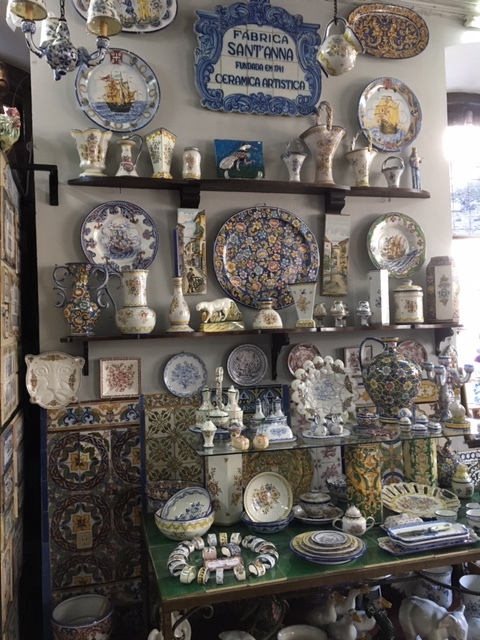 However, their shop in the Chiado neighborhood display all their products, from individual tiles to dishes to decor to fountains to bathroom sinks, in designs from traditional to modern. Blue seems to be the predominant color used, but all the colors of the rainbow can be found throughout the shop. Every type of dish imaginable it seemed could be found in the showroom, and of course more beautiful tiles. The shop also does custom designs and colors. After spending awhile looking at and gushing over the many different tile patterns and other products on display (and being thankful we don’t have room in our suitcases for any of it because we would have otherwise purchased several pieces), we headed back to the apartment. On the way we stopped in a pharmacy to ask about cold medicine and came away with cough syrup for Brett, cold tablets for me, Tylenol, and throat lozenges . . . all for a very affordable price. And they are working! We are still far from being well, but we are coughing less and feeling a bit better. We also wanted to make another stop at the neighborhood bakery we visited the other day. 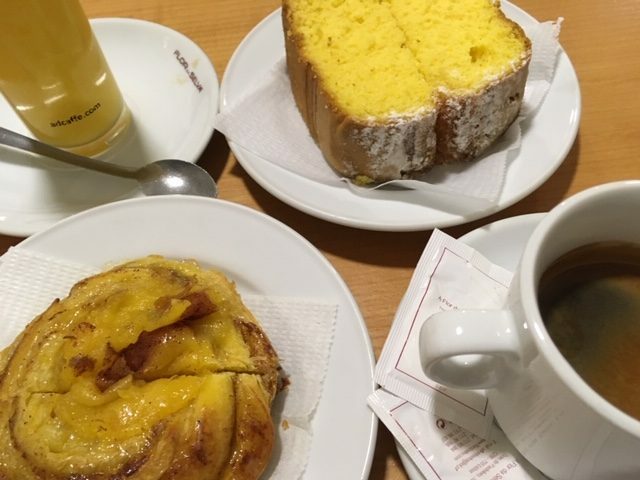 The waiter recognized us from our previous time there and in a matter of moments had us seated and our treats in front of us: a peach cinnamon bun and café Americano for Brett, and sponge cake and fresh-squeezed orange juice for me, loaded with vitamin C in every sip! We also ordered two Pastel de Nata to enjoy later this evening. After we finished our treats we were feeling too exhausted to do anything more so it was time to head back to the apartment, happily downhill all the way. It was a short but lovely outing in our neighborhood, and we’re glad we made the time. As for tomorrow, who knows? We will see how we feel in the morning before deciding if we are up to going out again, and if so, we’ll decide where then.